The Jake's Gift Card is perfect for the customer who likes to shop at our store at 2954 Lincoln Highway East, Gordonville, Pa. 17529. Gift Cards are not redeemable for cash or credit, except to the extent required by law. Gift Card sales are final and non-refundable. Maintenance, dormancy or service fees do not apply to balances on Gift Cards. 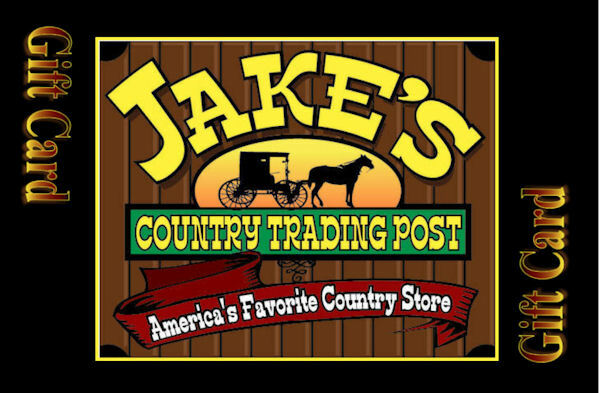 Gift Cards that are lost or stolen cannot be replaced, and Jake's Country Trading Post shall not be responsible for lost or stolen cards.